When we last saw the dovecote, the halftimber detailing on the walls was done, the roof was just started, and it lacked paint. Here’s the current state of the beast! Waiting for paint! Click for larger, as usual. 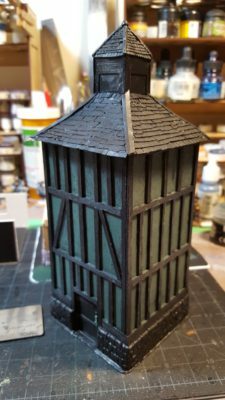 The roof got cardboard tiles to look like slate on both the main roof and the top of the tower. The capping along the ridges on the main roof is strips of light card, while for the tower roof I used greenstuff putty for the ridge caps and the little finial decoration right at the peak. I also used a bit of greenstuff to add a ring handle to the door, and some details to the hinges. The whole thing has been primed black, and then the wall panels between the timbers got a coat of GW Liquid Greenstuff to add some extra texture to those areas. I’ve also started work on a large farmhouse, two stories with a thatch roof planned for it. More photos of that soon, it’s coming along nicely and I suspect I’ll paint both buildings at the same time. I’ve had people ask about plans for these buildings. I rarely make formal plans for buildings in a way that would be useful to other people, to be honest! For the dovecote I started with the article in WS&S #87 and tweaked things slightly; the farmhouse is entirely out of my head, starting with a basic idea of how large I wanted the building to be (about 5″ by 3″, as it happens) and the basic features I wanted. I have spent some time looking at photos and sketches of the real thing; the post I wrote a few years ago on half-timber architecture in the Internet Archive is still useful, as is Google Image Search for terms like “17th Century English farmhouse” and similar. A lot of buildings like this, especially rural or village buildings, could be pretty wonky and random, so it’s kind of hard to get things wrong! If in doubt, just chuck a coat of plaster over it, like real builders have been known to do! Dusting off my sadly-neglected blog this Canadian Thanksgiving weekend to post a link to a very cool trio of old movies shot in the early 1930s by the US Marine Corp in China. The US (as well as the British, French and a few other Western powers) maintained military forces in China right up into the Second World War, including aviation forces. I can’t seem to embed the videos, but head over to Leatherneck Magazine’s USMC Aviators in China article to find all three short, silent movie clips. If you were looking for scenery inspiration, a lot of this footage is at fairly low level, and while it isn’t hugely detailed you could get useful inspiration for Chinese buildings and compounds by peering past the airplanes! Hope any Canucks reading this are having an excellent Thanksgiving weekend. I’m trying to get back into the gaming thing after a summer and early fall of practically zero activity, so more content soon, hopefully! Quiet around here lately, primarily because all of my hobby time has been taken up painting White Russians for this evening’s first outing of Russian Civil War-flavoured Through the Mud & the Blood. We’re using the first scenario from the TFL scenario book Stout Hearts & Iron Troopers, “The Platoon Attacking a Strongpoint”, with the defending Germans swapped out for Whites and the attacking British swapped for Reds. The British platoon in the scenario has all the Lewis guns, dedicated bombers and rifle grenades of a fully-evolved late WW1 Western Front British unit, all of which the Reds lack, so the Reds might get a fifth rifle section to make up the lack of specialized firepower. Off to pack figures and head for the game, report here tomorrow, hopefully with photos if any of them turn out! Richard Clarke of TooFatLardies has written a fascinating post over on his Lard Island blog about friction in games and in reality. Short version: real war is full of things going pear shaped; most gaming systems aren’t. Go read the full article, I’m doing it a terrible disservice with my one-line smartass summary! Should you want to read old von Clausewitz yourself, Project Gutenburg has an English translation of On War, Vol. One free to download. The short chapter Richard refers to in his post is Chapter VII. Friction In War — even for those of us with short attention spans, well worth a read! This counts as another prod to get more figures painted for Through the Mud and the Blood, too! Created a new Historical Gaming page, which has replaced the ECW/TYW page in the top menu; there’s also a matching Historicals category now to populate the page. With my interests wandering into the Great War, Russian Civil War, English Civil War/Thirty Years War and elsewhere recently, a new catchall page was needed. I’ve retroactively added old posts to the new Historicals category as well. There will, of course, be a lot of overlap with my long-standing Pulp interests, which is only natural as most of my developing historical interest grew out of the quasi-historical pulp games we’ve been playing for the last several years! Expect strongly pulp-flavoured history, as well! Having recently picked up a copy of TooFatLardies’ Great War large skirmish rules Through The Mud and the Blood, I went looking for further reading. The Internet Archive (Archive.org) is, it turns out, a treasure-trove of period manuals, books and documents for the Great War/World War One era. If you’ve never heard of the Internet Archive, it’s a huge and sprawling website full of all sorts of material. Probably the most famous section is the “Wayback Machine“, an attempt to collect, curate and archive huge swathes of the internet. Looking for an interesting old wargaming website, perhaps one hosted on Geocities or another vanished host? Fire the old URL into the Wayback Machine, you’ll probably find something! Week 9? There was no Week 9. Well, OK, there was, but it involved me running my ECW Parliamentarian Horse again, and them getting beaten. Again. For God And Parliament! 28mm English Civil War horse charge down a country lane. As always, click for full size. In better news, LPL5’s final, ultimate round, Round 10, with the bonus theme of “A Scene from the Movies” is running right now. All sorts of great stuff, including a bonus-worthy set of miniatures from me that I really like, and that other people do too, judging by the voting! LPL5 Week 8: For God And Parliament! 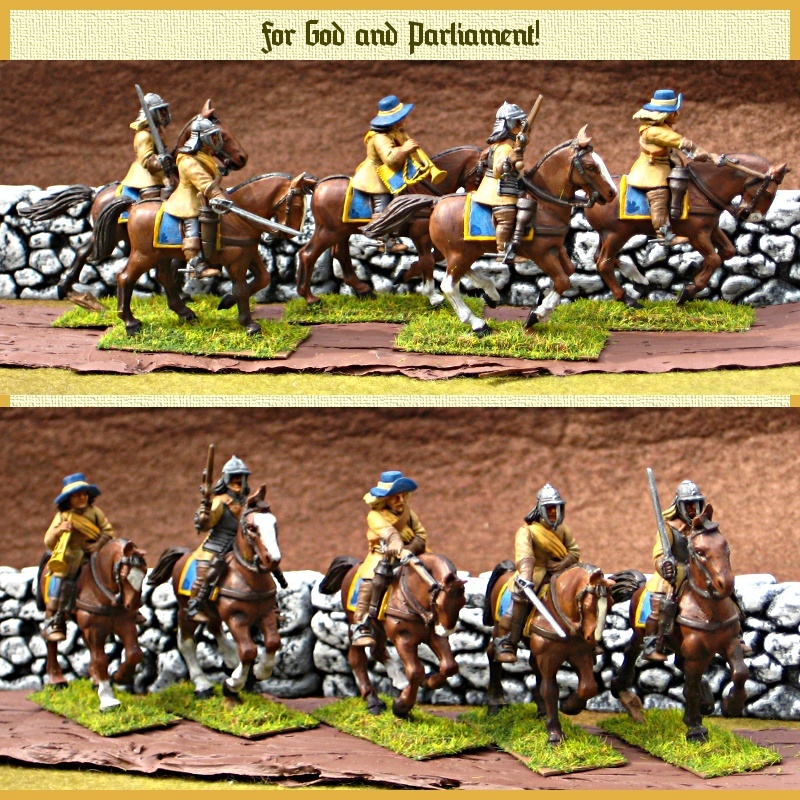 For the 5th Lead Painters League’s 8th Round, something entirely new from me: 28mm English Civil War/Thirty Years War cavalry! These are Warlord plastic horse, nominally ECW Parliamentarian horse but really destined for our gaming group’s quasi-historical nominally-Thirty Years War games. They’re also the first 28mm cavalry I’ve ever done, the first plastic wargaming figures I’ve ever done, and the first non-20th C historicals I’ve ever done. All at once! Unfortunately they got beaten soundly by a nicely presented and very characterful set of 28mm Middle Eastern figures.